Tendency towards excess weight, disproportionate protrusions of the figure, especially around hips, waist, post pregnancy weight gain, easily fatigued, obesity. PRESENTATION: 60 ml. Bottle with Cap & dropper. 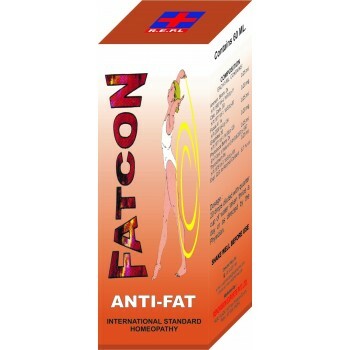 Shelf life and special conditions for storage: Fatcon ANTI -FAT is a Homoeopathic medicine, so it may be kept forever if It should be stored in a cool, dry place, should be proper & tightly caped and protect from sunlight.